The one and only Philip Z. Graham on Market Street, St Andrews. In the last 30 days there have been three searches for “Philip Graham” on my blog. I know this because I have the Search Meter WordPress plugin activated on my blog. Who am I to deny my readers from what they are wanting? Phil is a friend of mine from my school days in Selkirk. We also spent the same four years in St Andrews, while I studied Divinity he was across the road studying Mediaeval History. 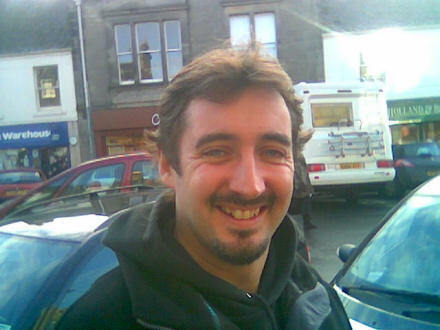 Phil then stayed on in St Andrews for a few years making picture frames before jetting off to Japan to teach English, where he’s been ever since. 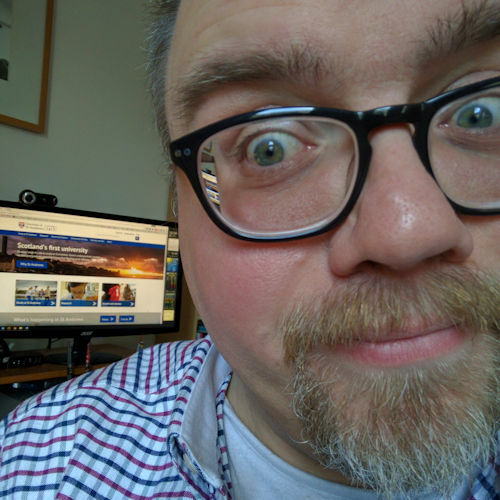 So there I was on Monday 18 December sitting at my desk working on a presentation for the following day when all of a sudden, like the shopkeeper in Mr Benn (but not dressed like the shopkeeper in Mr Benn) Phil appeared at the window. He’d been visiting a friend in the library and knew that I was working in the (no sniggers please) Butts Wynd area. It was really great to see him again. We went to Macgregors for coffee/hot chocolate and chatted about the last ten years, about his time in St Andrews and Japan, and mine in stipendiary ministry and out. And then we said goodbye. No! Not like that! We just shook hands. And that’s when I took the photo on my Nokia mobile phone. 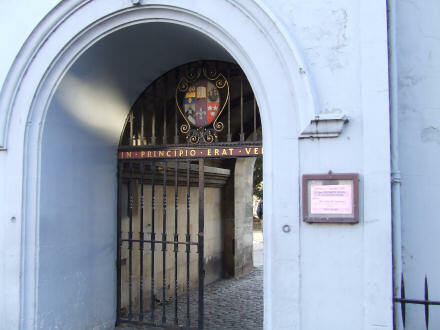 On most days during term between 1989 and 1993 I walked through these gates (pictured above) into St Mary’s College in St Andrews. 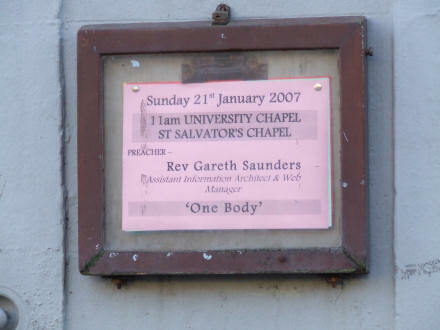 Each day I did I walked past a small noticeboard that gave details of the next service in the University chapel and advertised the name of the preacher. I always assumed that these preachers were all important and distinguished scholars, big names on the international theological preaching circuit. I was given the Revised Common Lectionary passages in early December and had to provide a sermon title before the end of term … before I’d actually written my sermon. I chose to preach on 1 Corinthians 12: 12-31a and I’m hoping that “One Body” is vague enough to cover what I’ll eventually preach on (once my sermon has been written) without the only “one body” being mine in the pulpit. I’m sure it’ll be fine, but if you would please pray for me this week as I read the passage again and again, and read around it, that I’ll be inspired to find the right thing to say for this University congregation.